Free Business Cards & Other Printed Stuff! 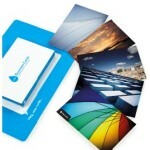 I first got to know of Vista Print and their fantastic freebie deals a year ago, perhaps longer. However, it was only a few months ago that I became their customer. I got myself some business cards and postcards, among other things, all for free, except that I had to pay for international shipping and handling. This entry was posted in Freebies and tagged business card, business cards, free business card, free business cards, free card, free cards, free printables on January 22, 2008 by Cyberpartygal.